These two little pieces were made with pages from an old National Geographic magazine, altered by spraying them with citrus solvent, which dissolves the ink and allows the colors to blend and move around on the page. Then the patterns were drawn in ink. I think the circles turned out better than the squares, but they’re both intriguing to look at. 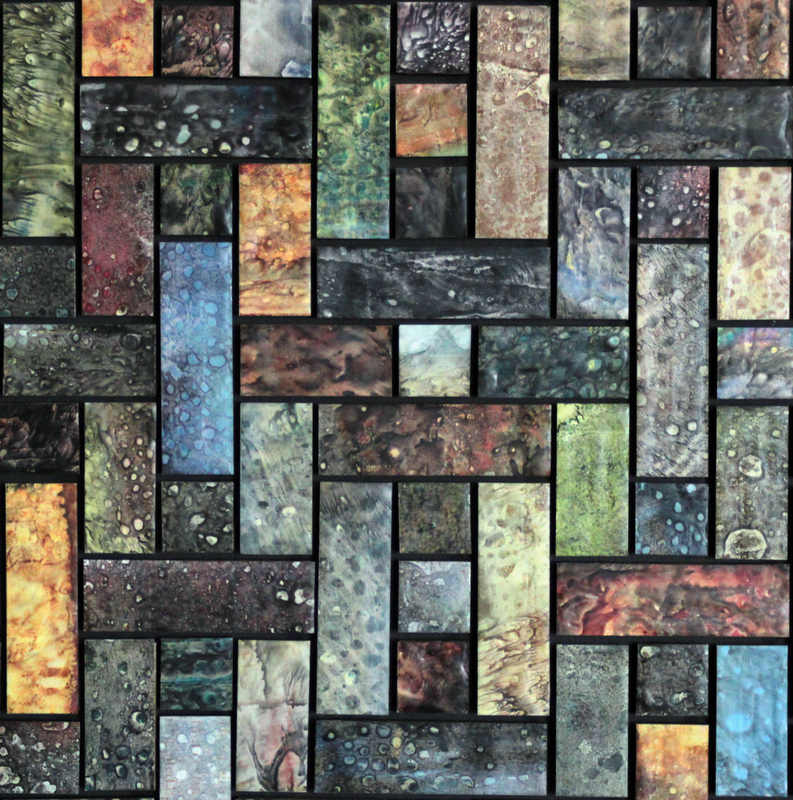 This piece is made almost entirely of recycled and reclaimed materials. The papers on the surface are pictures from old magazines, modified with Citrasolv, a citrus cleaner that dissolves the ink. The tiles are cut from old wood-laminate flooring, salvaged from a remodel project in my neighborhood. Papers are adhered to the tiles, and the surface coated, with encaustic wax made from the leftover stubs of church candles. The backing is an old cabinet door, and the sides of the frame are made from scrap lumber, stained with vinegar and steel wool, and sealed with beeswax and olive oil. 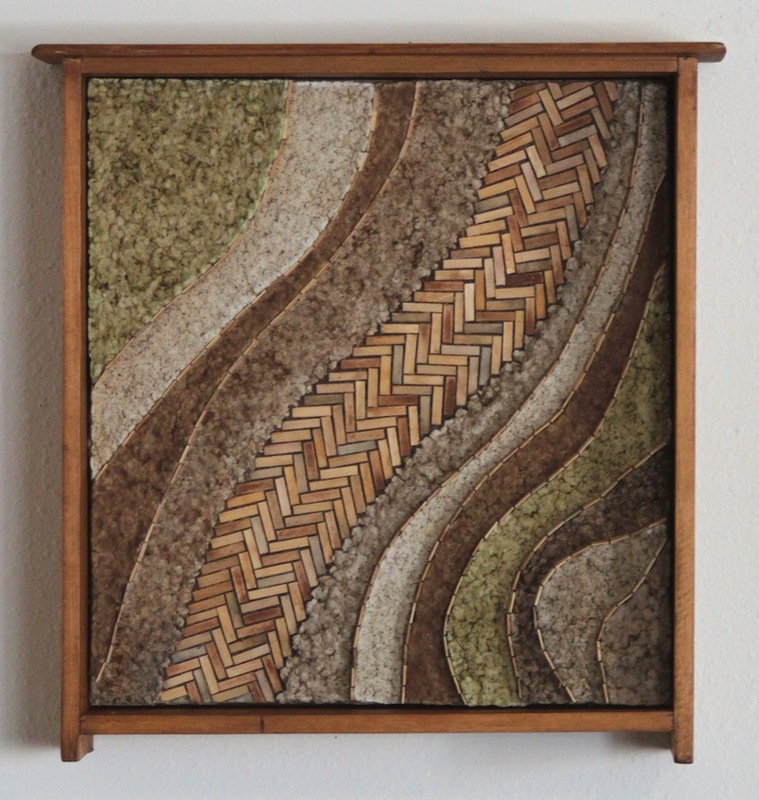 The pictures I used were all from old National Geographic magazines, so my original idea for a title was just to call it Exploration, and then I decided on the arrangement of the tiles, which is a weaving pattern called point twill, so it became the Point of Exploration. 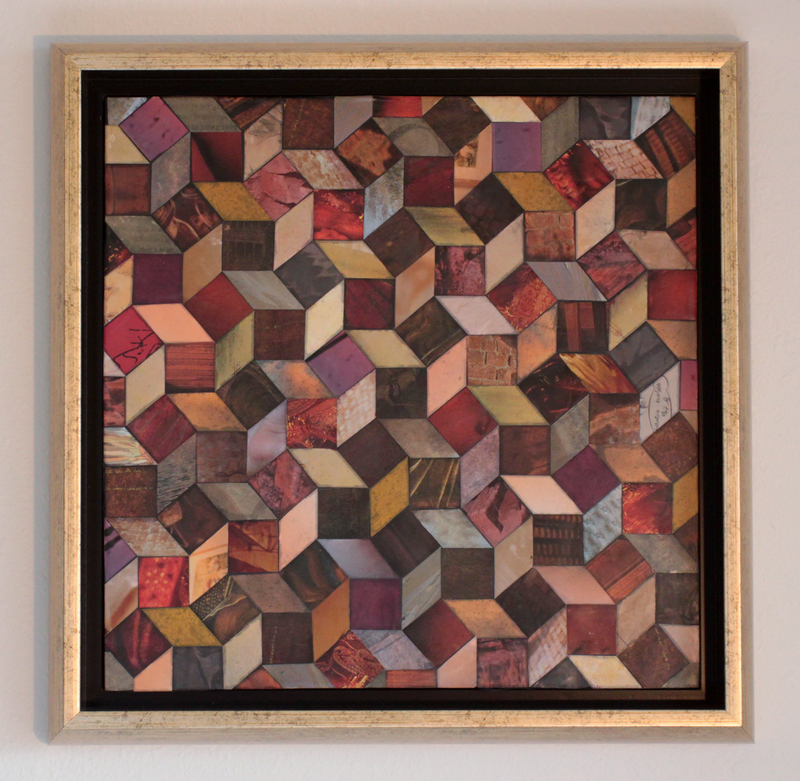 The Daily Habit – coffee shop debris – 16″ x 18″ x 5″ – 2014 – $425. 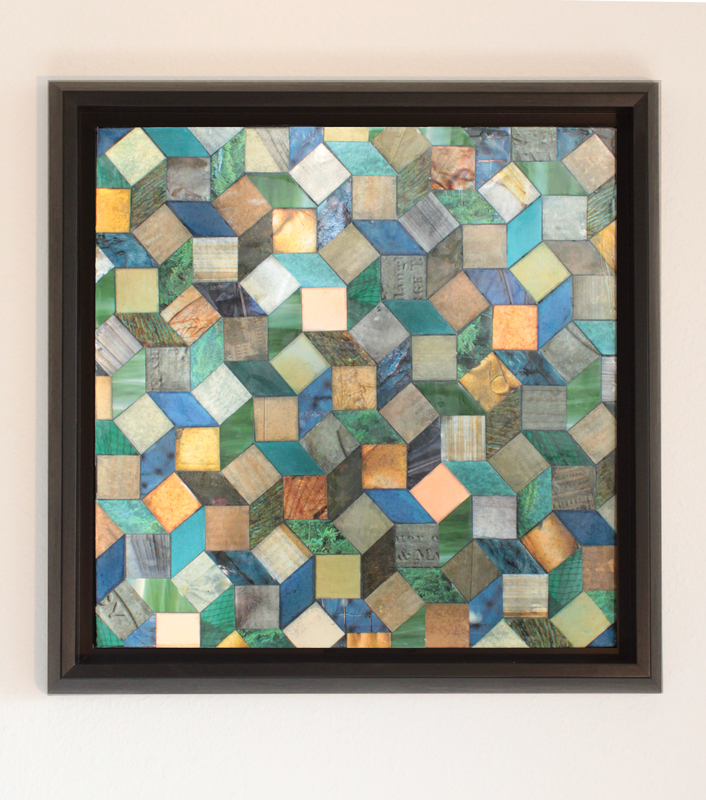 This piece is made primarily with debris from a couple of local coffee shops. The path in the center is made with used coffee stir sticks, stained with coffee, tea, and cocoa. Contours on either side are built up with corrugated cardboard, and covered with papier mache’ made of newspapers, lightly used paper napkins, coffee chaff (a by-product of coffee roasting,) and tea leaves, with a small amount of caulk left over from a home tiling project, and some wood glue. Both are sealed with watered-down wood glue. Frame is an old drawer, sanded and stained with a mixture of coffee, black tea, and cocoa, and sealed with beeswax and olive oil.Working with these materials was fun, although I had some difficulties getting the texture of the papier mache right; newspaper is not very high-quality paper. I especially enjoyed making the herringbone pattern path, an ancient brick pattern I found in an article about archeological treasures of Afghanistan. The photo doesn’t show it well, since you can’t see the sides, but the ratty old drawer I started with became a beautiful object with sanding and many coats of coffe, tea, and cocoa stain, and a hand-rubbed finish. 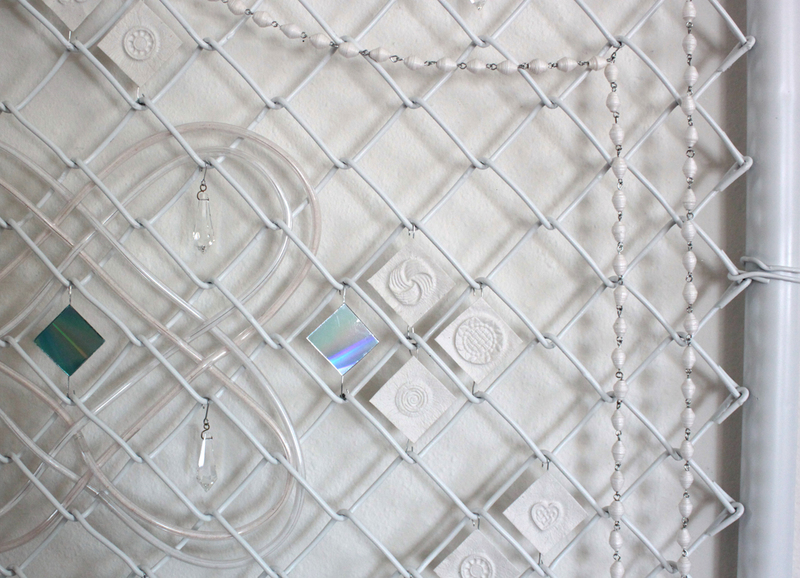 This is a playful piece, which was labor-intensive but fun to make. It is almost entirely made of recycled and reclaimed materials. 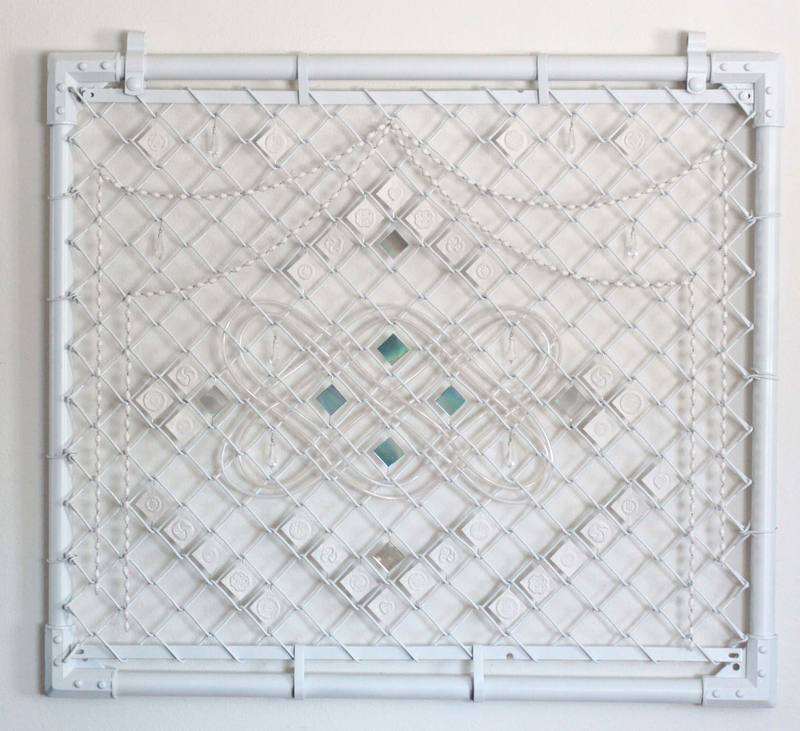 It began with an old chain-link gate, which got spray-painted white. The paper “pearls” are made from strips of an old Japanese advertising poster, rolled up to make beads, and they are chained together with paper-clips, salvaged from a corporate file-shredding event. The infinity knot in the center is made from two pieces of oxygen tubing, one filled with kosher salt, the other with himalayan salt. Crystal drops from an old chandelier are hung with paper-clip wire, as are the shiny diamond shapes cut from old computer CDs. Also suspended the same way are cast paper medallions, which are made from toilet tissue; from the centers of large commercial rolls that get changed out before they run out completely. 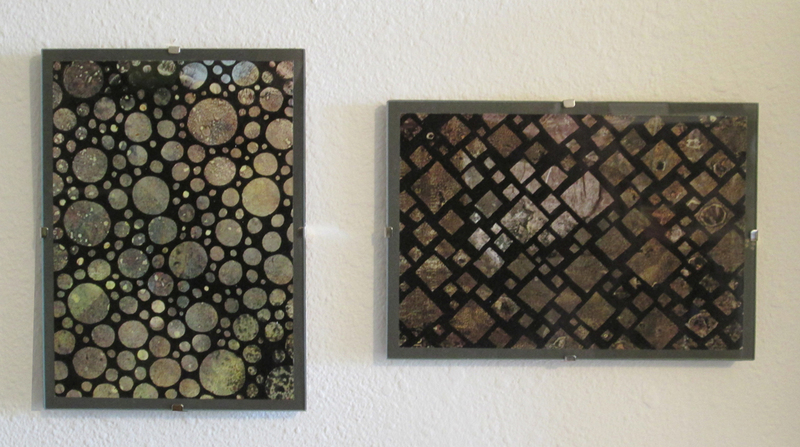 The patterns of the cast paper were made with molds of old buttons. Pushpa is the sanskrit word for “flower.” This piece was made for my brother’s house, to provide a focal point for a little room with a peculiar sponged-on paint job. The substrate is several pieces of salvaged flooring, fitted and glued together, which are covered with wall-texturing plaster. Watercolor paint is brushed over the plaster, then the design is inscribed through the color with a sharp tool; a technique that is referred to in ceramics as sgraffito. A second piece made with the combination of squares and diamonds that makes this lovely tumbling pattern. This one looks at first glance like it might be made out of wood, because of the colors. Like Liberty, it is named for the image on the central piece; a man walking behind a plow. 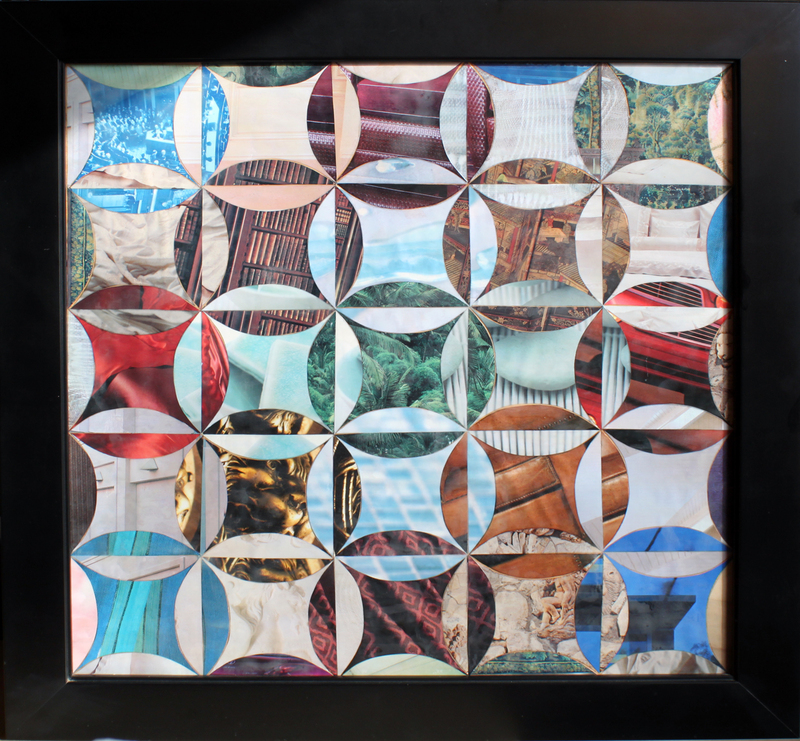 The frame is made from recycled plastic bottles, the substrate is a piece of an old poster, and the images are from discarded magazines, making this piece almost entirely recycled. The pattern here is one I discovered in researching ancient roman tile patterns, and I fell in love with how dynamic it is. This is the first of two pieces I made playing with this pattern. 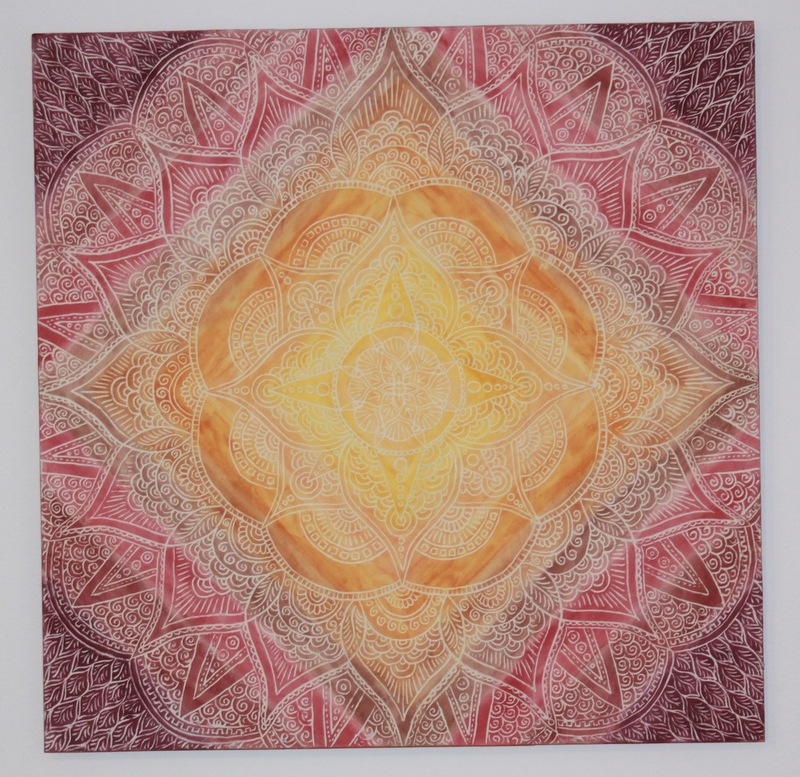 Most of the piece is made with pieces chosen for their texture, color, and value (lightness or darkness,) rather than recognizable images, but the title comes from the image on the very center piece. Click on the image above to see a larger zoomable version. 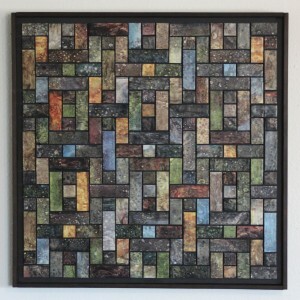 The frame is made from recycled plastic bottles, which are transformed into a classy wood substitute, and the backing board is recycled also. How Will Peter Pay the Lions? This is a companion piece to Loose Connections, also made with magazine images and wax encaustic. 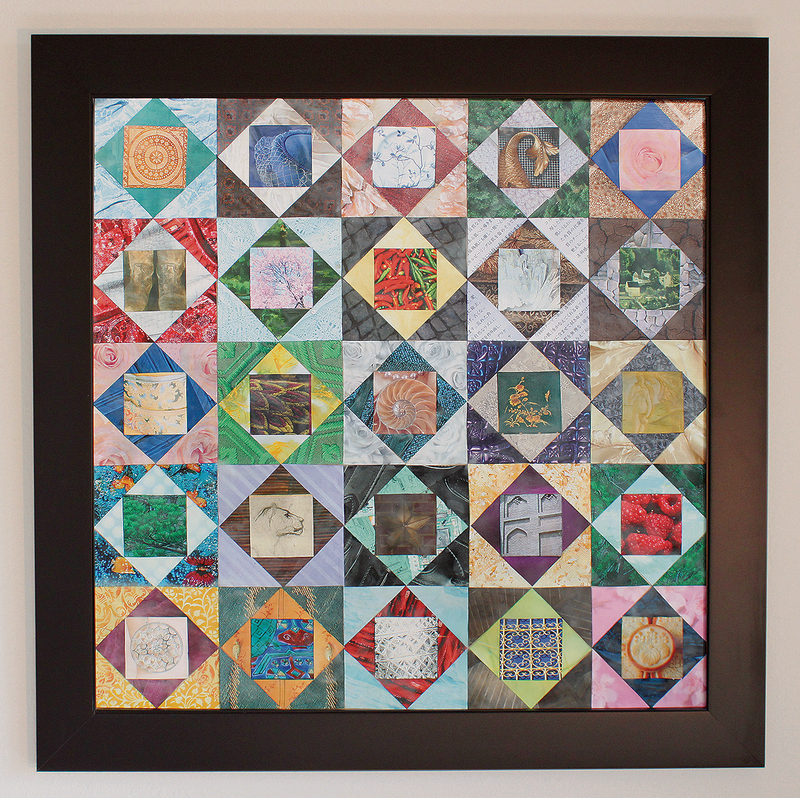 The quilt pattern on which it is based is called Robbing Peter to Pay Paul, because an arc is cut from each of the sides of a square and rotated out into the next square, to be replaced by an arc from the adjacent square. Can you find the two lions? 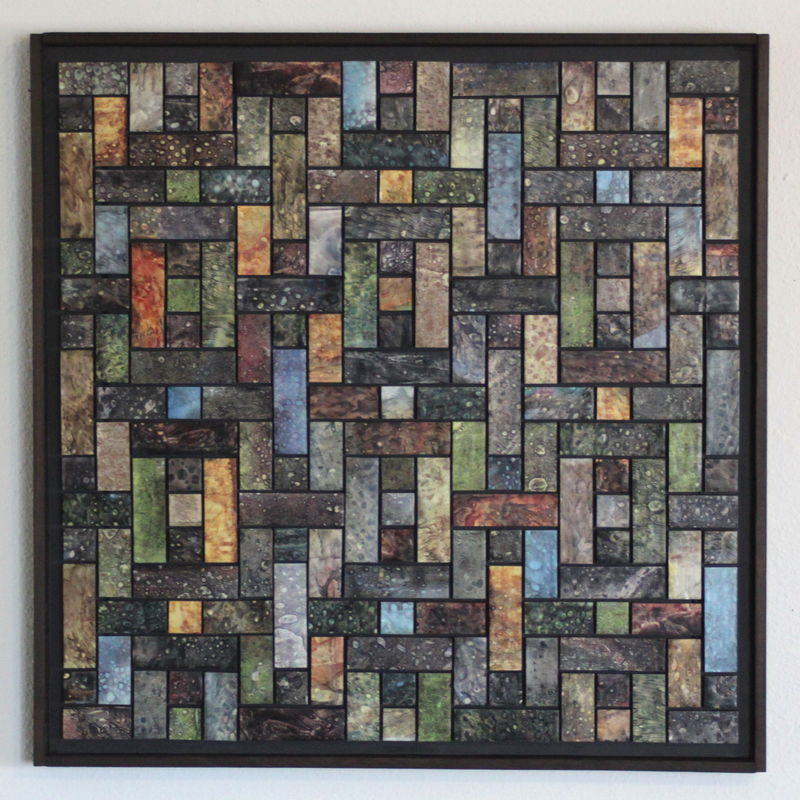 This piece is based on a very old pattern of a square within a square within a square, which shows up in everything from medieval stone pavements to traditional American quilts. The name comes from the way that even though the images were chosen randomly, without any theme in mind, our brains want to make connections between them and find meaning.